Eco-tourists who venture to the far Russian North will find interesting architectural monuments as well as stunning natural scenes. The historic Russian North encompasses a vast territory and diverse ecology. This is particularly evident on the Kola Peninsula in the Murmansk Region, whose severe climate is modulated by sea currents that flow past the North Cape. The peninsula's northern shore is washed by the Barents Sea of the Arctic Ocean, while the south shore forms the upper boundary of the White Sea. The westernmost point of the south shore is the town of Kandalaksha (population 33,500), located at the tip of Kandalaksha Bay. Kandalaksha is readily accessible on the main rail line from Moscow to Murmansk, Russia's major northern port, located 150 miles to the north. The settlement's origins are shrouded in obscurity. It may have been founded as early as the 10th century, but the first recorded reference is 1516, by which time the territory had been absorbed into the Muscovite principality. Nothing of antiquity has survived in Kandalaksha. Its history has been marked by grim endurance and devastating raids – one of which was unleashed by Ivan (IV) the Terrible in 1568. There was even a brief attack by a British force in June 1855, during the closing phase of the Crimean War. A small monastery in the village was closed in 1742. To get to Kandalaksha take a train from either Moscow or St. Petersburg to Murmansk. The trip takes approximately 30 hours from Moscow and 22 hours from St. Petersburg. During World War II, Kandalaksha served as a strategic rail point for the delivery of supplies from Allied convoys to the port of Murmansk. Although lacking historic architecture, Kandalaksha is surrounded by dramatic scenery, high cliffs and rapid rivers. These features along with the town's accessibility, make it a gateway for eco-tourists interested in hiking, kayaking and fishing. Kandalaksha also sits at the beginning of the road to one of the most spectacular wooden monuments in Russia – the Church of the Dormition in Varzuga. This road first leads 65 miles east to the small town of Umba (population 5,500). The town is scenically located on a river of the same name, which empties into Kandalaksha Bay. The earliest written mention of Umba dates to 1466. For centuries, the settlement formed part of a network of villages belonging to the great Transfiguration Monastery on the Solovetsky Archipelago in the southwestern part of the White Sea. 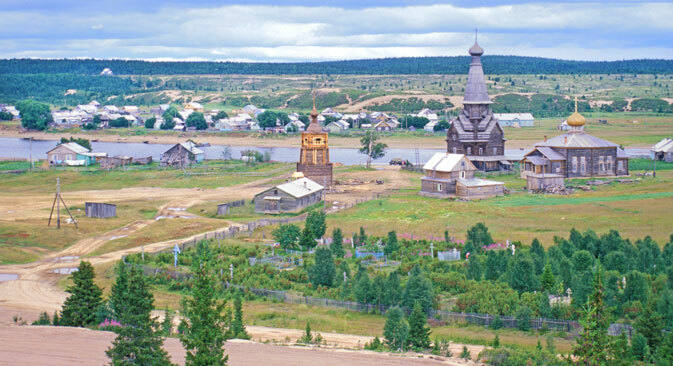 Although contemporary Umba is largely a creation of the Soviet period, the town still has a district with traditional wooden houses and a small, informative local history museum. Attempts to restore the wooden Church of the Resurrection on the left bank of the Umba River were halted when the parish preferred to meet in a modest structure more centrally located on the right bank. Beyond Umba, the tenuous road becomes even more primitive on the way to Varzuga, some 85 miles to the east. One of the most distinctive villages of the Russian North, Varzuga is commandingly placed along high banks on both sides of the Varzuga River just north of its mouth on the White Sea. The river is considered the beginning point of the Tersky Shore, the eastern edge of the Kola Peninsula. Some official sources state that the current population of Varzuga is approximately 900, but this figure includes other villages in the area. The 2010 census gives Varzuga itself 363 residents. By contrast the population in 1910 was approximately 1,000. Varzuga is first mentioned in written sources in 1466, when the area was still nominally under the control of the medieval trading city of Novgorod. By the end of the 15th century, the area had entered the domains of Muscovy. The prosperity of Varzuga in the middle of the 16th century came to an end when it, like Kandalaksha, was raided as part of a campaign by Ivan the Terrible to extort further revenues for his military campaigns. From the 16th to the latter part of the 18th century, Varzuga was economically linked to various monastic institutions, in particular the Solovetsky Transfiguration Monastery. The dramatic, soaring landmark of Varzuga is the wooden Church of the Dormition of the Virgin, which rises 111 feet above the high right bank of the Varzuga River. Remarkable for its construction logic as well as its beauty, the basic log structure from 1674 has withstood the elements in its exposed location. A number of modifications were made in the 19th century, when both exterior and interior were clad in plank siding. A restoration completed in 1973 returned the upper part of the church to its original appearance. The icon screen was dismantled for restoration of the interior, where work slowly continues. It should be emphasized that the church was recently again clad in painted plank siding, which conceals important details of the log structure. Adjacent to the Dormition Church is the Church of St. Athanasius the Great, a more modest heated structure built in 1854 for worship during the winter. It now serves as the local parish church. And on the left bank are two smaller churches dedicated to Sts. Peter and Paul and to St. Nicholas. Neither has been restored; the latter was used as a village store. As for centuries past, the basic economic asset of Varzuga is its fishery, which continues to exist under skillful local management in the post-Soviet era. This enterprise provides jobs and a measure of stability for those who have lived in the area for generations. In recent years Varzuga has gained another source of income as a prime location for salmon fishing. Sports tourism has become a boon to many residents of Varzuga and is closely related to the fishery. The village has also recently been connected to the regional power grid, which ensures a dependable power supply. Behind the village on both sides of the Varzuga River are high dunes covered with juniper bushes. Farther inland are dense forests of small conifers with a deep mossy carpet. The landscape is especially beautiful in the summer, a time of almost constant light. But the sea Is the ultimate defining element in the culture and geography of this enchanted area. The Varzuga empties into the White Sea at the small village of Kuzomen. The village now has a wooden church of its own, completed in 2012 and dedicated to the Purification. But its gritty endurance is evoked most clearly in its weathered wooden houses and its cemetery, whose crosses are nestled in the dunes at the edge of the sea.